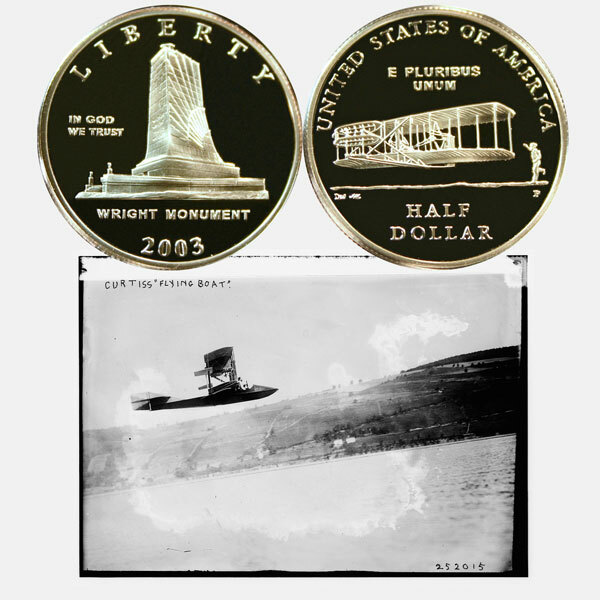 Today, the First Flight Commemorative Half Dollar Coin remembers the day Glenn Curtiss invited the press to observe his take-off from and landing on water in San Diego harbor on January 26, 1911. This caused several years of petitions and reversals for Mr. Curtiss in his bid for the patent for his successful water aircraft. Finally, in December 1921, Curtiss won his patent for the invention he successfully demonstrated in January 1911. The United States Circuit Court of Appeals of the Second District on December 15, 1921, reversed the decision of the United States District Court of the Eastern District of New York and held that Glenn H. Curtiss was the first person to invent and operate a successful and practical hydroaeroplane or flying boat and has awarded him the broad patent thereon. The decision is regarded as one of the most significant developments in aviation since the adjudication of the Wright patents, as it serves notice to the world that credit must go to the United States, not only for the first practical flights by machine-propelled aircraft from the ground and back to the ground, but from the water and back to the water, as well. Justices Merrill Hough, Martin T. Manton and Julius M. Mayer were on the bench, Judge Hough writing the opinion. The decision was rendered specifically against patent No. 1,312,910, which was issued to Albert S. Janin, of Staten Island, on August 12th, 1919, and which has been the subject of controversy in the Patent Office and the courts since 1913. After the Wright Brothers successfully demonstrated mechanical flight, the next obvious step in realizing full dominion of the air was to construct and operate an aeroplane capable of taking off from and alighting on the water. Glenn H. Curtiss had been working on this idea as far back as 1908. So, too, had individuals in Europe, the most prominent of whom was the Frenchman Fabre, who in 1910 succeeded in getting off the water with a “tripod” gear, but failed in landing, repeatedly wrecking his machine, including his final attempt. The court has held that Mr. Curtiss has been shown to have been the first man in the world to successfully arise from and alight upon the water. A situation of international importance is thus created. Mr. Curtiss’ work was carried on at his plant at Hammondsport, N. Y., as early as 1910, when preparing for the flight down the Hudson from Albany to New York, he had successfully alighted upon the water by means of pontoons attached to his landing gear. In the same year, 1910, he operated his first primitive canoe or boat-like structure of a hydroaeroplane on the surface of the water. In 1911 he built and successfully operated the world’s first flying boat. On January 24th, 25th, and 26th, 1911, in the San Diego, Calif., harbor, he took off from and alighted on the water. His flights on January 26th were publicly announced and witnessed by newspaper men and recorded in the press. On August 22nd, 1911, Mr. Curtiss filed application for a patent on the boat hull structure which has since been demonstrated and is now legally and finally recognized as the basis of all subsequent marine flying developments throughout the world. On January 26th, 1911, the very day that Mr. .Curtiss’ flights were being publicly observed in San Diego, Albert S. Janin filed application for a so-called land, water, and air machine. On July 31st, 1913, Janin filed a subsequent application substituting for the previous application, but retaining the date of the first. It was alleged that new and different drawings were offered which rendered the first application inoperative. It was further alleged that the last application concealed features upon which the first claim was based. When Mr. Curtiss made application on August 22nd, 1911, interference was declared with the prior application of Mr. Janin, but the Examiner decided in favor of Mr. Curtiss. The Board of Examiners in Chief reversed the ruling in favor of Janin and the Commissioner of Patents in turn reversed it in favor of Curtiss. Janin carried the case to the Court of Appeals, of the District of Columbia, and won the decision by a majority of the court, after which Janin’s patent was issued. Mr. Curtiss then took the fight into the U. S. District Court to compel the Commissioner of Patents to grant him a patent for the invention. Judge Chatfield in 1919 dismissed the bill, holding that Janin was entitled to the invention. Another appeal was taken by Mr. Curtiss to the United States Circuit Court of Appeals of the Second District, and the District Court was reversed. Judge Hough in his decision, declares the fundamental point to be whether Janin, in his original application, of January 26th, 1911, disclosed an operative hydroaeroplane or flying boat and then answered this in the negative. One of the interesting features of the evidence produced at the trial was a sketch presented by Janin and claimed by him to have been made in 1899 when he was a carpenter lad of 19. This sketch illustrated a hydroaeroplane having many modern features, including the now famous Wright invention on the ailerons and the Joy-Stick control and other modern features invented years afterward by famous aeronautical engineers. The article continues to describe more of the Curtiss Company’s patents and the challenges associated with those patents and the industry. The First Flight Commemorative Half Dollar Coin shows with an image of a Curtiss Flying Boat, circa 1912, over a lake in New York.